Misool Eco Resort is an exclusive dive resort and conservation centre located in remote southern Raja Ampat. Misool’s resort island, Batbitim, is a true tropical hideaway, just south of the equator and fringed with powder-white beaches and pristine coral reefs. With a maximum capacity of just 32 guests and a staff-to-guest ratio of 3 to 1, Misool offers exclusive diving holidays, surrounded by the world’s richest reefs. 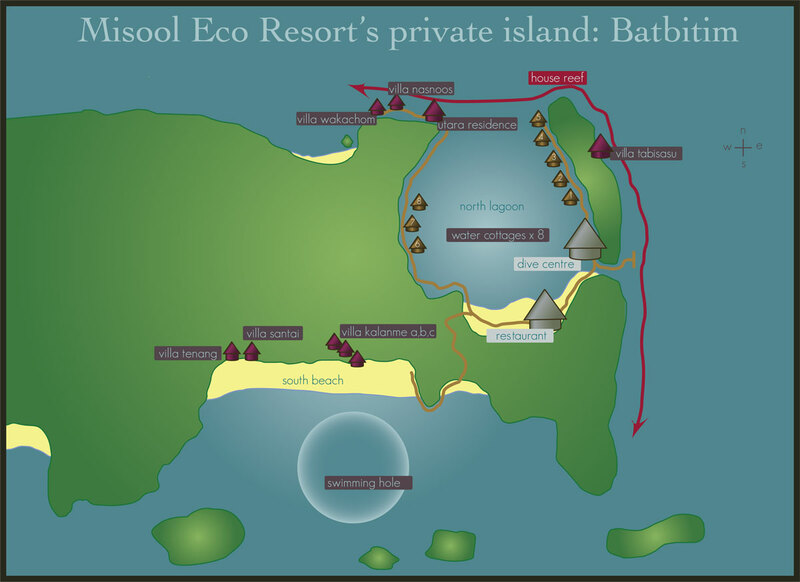 Misool Eco Resort is surrounded by their own 1,220 km2 Marine Protected Area, and inside the 46,000 km2 Raja Ampat Shark and Manta Sanctuary which they helped to create. Misool Eco Resort was built entirely of reclaimed tropical hardwoods, milled on site with their own portable sawmill. Misool’s accommodations have been meticulously designed for comfort, privacy, and sustainability. All of their accommodations feature Balinese-style open air bathrooms, air-conditioning, fresh hot and cold showers, mini-bars, in-room safes, and handcrafted furniture and fittings. Misool’s eight rustically luxurious Water Cottages are located in the North Lagoon, just steps from the dive centre and restaurant. The Water Cottages are built on stilts over the water. For lazy afternoons with a good book, there is a hammock built right into the veranda. The view from your veranda is framed by a traditional grass roof, offering a high degree of privacy as well as shade. Stairs lead down from your veranda to the North Lagoon, and the House Reef is just a few fin kicks away. The Utara Residence is built on stilts on the western edge of the North Lagoon and overlooks the House Reef and the spectacular dive sites of Fiabacet beyond. This Villa features two ensuite bedrooms, a shared common area with a half bath, a loft, and a massive veranda. This Villa is especially recommended for families or groups of friends. Villa Kalanme is located on the secluded South Beach. This Villa, named after one of our island’s most important spirits, is a complex of three separate ensuite bedroom units, with a shared round-roofed living area and huge outdoor living space. This Villa is particularly well-suited to those who enjoy greater privacy and gorgeous white-sand beaches. Access to this Villa is either by water taxi (on call and reachable by radio), or by a scenic but steep paved path. Villa Santai and Villa Tenang are Misool Eco Resort’s newest Villas and are located at the far end of the South Beach. Two stunning ensuite bedroom units are built under the shady coconut palms, with expansive views over the Southern horizon from the huge terraces. Access to Villa Santai and Villa Tenang is either by water taxi (on call and reachable by radio), or by a scenic but steep paved path. Villa Tabisasu is located on the eastern edge of the North Lagoon. This Villa, named after the local word for ‘orchid,’ features an ensuite bedroom and conjoining living area. The outdoor living-area face east and enjoys glorious sunrise views, all your own. This Villa is perfect for couples who appreciate a bit more space. The resort’s massage and beauty treatments feature Misool Eco Resort’s signature range of natural products, most of which they create fresh each morning in their own kitchen. They use only food-grade ingredients, and choose local organic products whenever possible. You’ll find scrubs hand-blended from local ingredients such as candlenut and coconuts, face toner derived from freshly pressed cucumber, body wraps using home-grown aloe plants and freshly harvested banana leaves, aromatherapy using fragrant hand-pressed coconut oil, and scrubs using coffee from the highlands of Papua. You can enjoy Misool’s massage and beauty treatments in the privacy of your own room or at The Lookout. Misool’s restaurant is located on the beach overlooking the North Lagoon. The airy, round-roofed structure is tucked under the coconut palms, offering a perfect respite from the mid-day heat. The restaurant’s terrace is the ideal place to enjoy a sunset cocktail or a bottle of wine while watching the baby sharks and long-toms hunt schools of circling sardines. Misool offers a broad range of Asian and Western cuisine, with a focus on fresh, local, and organic fare. The resort offers four meals per day, plus afternoon tea on the terrace, with freshly baked treats like lemon and cardamom biscotti or island-fresh banana fritters with shaved white chocolate. Snacks and drinks are available throughout the day. Misool Eco Resort’s dive centre is located in the North Lagoon, built on stilts overlooking the turquoise water. The dive centre is spacious and airy, and well-suited to professional photographers and videographers. The 50 m2 wet area is equipped with a massive work station, perfect for setting up cameras, charging torches and laptops, etc. The adjacent dry area is furnished with comfortable lounge chairs, a small library, and a monitor for reviewing the day’s images. There is also a sunny 120 m2 veranda just outside, perfect for warming up between dives. Access to the water from the dive centre is either from stairs leading directly down into the North Lagoon, or by way of the jetty, where Misool’s 4 dive boats moor up. 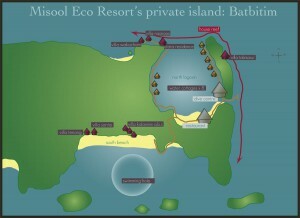 Misool Eco Resort generally schedule 3 guided boat dives per day, as well as either a dusk dive or a night dive. Because their dive sites are so close, you usually come back to the resort for the surface interval after each dive. All Misool’s dive packages include free Nitrox for Nitrox certified divers. Misool’s House Reef is a shore dive, easily accessed at any time from either the end of the jetty, the dive centre, or the steps leading down from your Water Cottage accommodation. On a rising tide, jump off the end of the jetty and enjoy an easy drift North through the channel, which is exposed to variable current. Schooling Horse-eyed Jacks congregate under the pier, joined by massive schools of Fusiliers and shoals of passing Anchovies. Several very large Groupers make their home in the depths under the jetty, and they often appear to inspect visitors to their reef. Large Blacktip Reef Sharks are regularly seen patrolling the deeper areas, as well as the occasional Grey Reef Shark. As you drift north through the channel, the topography shifts from a gentle slope to steep wall, festooned with colourful soft corals, huge gorgonian sea fans, and sea squirts and tunicates in a multitude of sizes and shapes. A close look at Muricella and Annella sea fans often reveals the elusive Bargibanti and Denise Pygmy Seahorses. If you time your dive just right, you’ll have a good chance of seeing the stunning Mandarin Fish, who make their appearance just before sunset. They are joined by the spectacular displays of several species of Flasher Wrasse. The newly-discovered ‘Walking’ Epaulette Shark is also regularly spotted in the shallows, scooting along with their pectoral fins and hunting for their next meal. You’ll also find innumerable species of Nudibranchs and Flatworms. Misool have explored over 60 dive sites within a 1 hour radius of the resort, and there are many more waiting to be explored. There are over 25 world-class dive sites within a 15 minute radius of the resort, including Fiabacet, Boo Windows, Yilliet, Wobbegong City, and Magic Mountain. Nudi Rock: A small island in the Fiabacet chain, which looks an awful lot like a Nudibranch from a distance. Just a quick 5-minute speed boat ride from the jetty, this site is a must for critter enthusiasts and macro photographers. True to its name, you’ll find a wide range of Flamboyant Nudibranchs lurking among the abundant soft corals. The sea fans are well populated with Pygmy Seahorses and Cowries. Be sure to inspect the abundant crinoids for their colour-coordinated Arrowhead Shrimp and Cling fish. When currents allow, this site is also popular for its pinnacles crowded with larger pelagics like Barracuda, Big-eyed Trevally, and the odd mature Grey Reef Shark. The sloping shallows of Nudi Rock are stunning for wide angle shots with exquisite colours and hard coral gardens. Magic Mountain: This seamount is located about 20 minutes from the resort, and is a busy Manta Ray cleaning station. The submerged pinnacle reaches up to about 7 meters, and you have a very good chance of seeing not one but TWO species of Manta Rays here – both the giant Oceanic birostris as well as the smaller Reef Manta, alfredi. Magic Mountain is also a nursery for Whitetip Reef Sharks and a love nest for Napoleon Wrasse. Because this site is completely exposed to oceanic currents, you can expect to see large schools of pelagics in the blue. Yilliet: The huge island of Yilliet stretches east to west about 15 minutes north of the resort. This island used to be home to an itinerant shark finning camp, and we are pleased by the stunning resurgence of life on its surrounding reefs, including Sharks. One of Yilliet’s tiny satellite islands is particularly rich and topographically weird. The tiny island has been undercut by untold millenia of wave action, forming an umbrella over a sloping underwater plateau with numerous spooky overhangs and cavelets. Diving with a torch is highly recommended for this site – you’ll want to illuminate the dark corners of this site to see all the critters, as well as the wild colours. Barramundi Cod and Hawksbill Turtles frequent this site. We also suggest you keep a sharp eye on the blue, as huge schools of Barracuda hover in formation. Boo Windows: One of Misool’s most famous dive sites, named for its unique topography. The site is a small island about 15 minutes from the resort, with 2 swim-through ‘windows’ carved into it. The South West face of this site is quite steep and exposed to current, so you are likely to see patrolling Sharks as well as the elusive Wobbegong Shark – be sure to look under the massive table corals! When the currents are right, you’ll move off towards a large pinnacle in the blue. The pinnacle is often surrounded by pulsating schools of Fusiliers and gangs of plate-sized Batfish. Heading back towards the Windows, notice how the sunlight filters through – it’s like nothing else on earth! You’ll follow the plateau of hard plate corals and look for Sweetlips hiding underneath. Be sure to investigate the huge barrel sponges – their crevices often conceal Hairy Squat Lobsters.